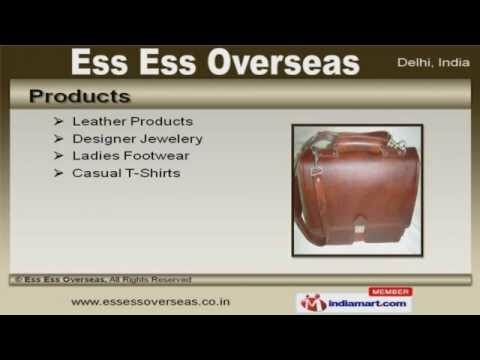 Welcome to Ess Ess OverseasManufacturer & Exporter of Ladies Fashionable Accessories and Appeals. The Company was incepted in the year 2002. Our Sophisticated manufacturing unithelp us to serve Indian Subcontinent. International quality standards, Attractive designs & Industry leading prices make us thefirst choice of our clients. We offer a splendid range of Leather Products, Ladies Footwear & Casual T-Shirts. Our Leather Products are widely appreciated in the market. Office Leather, Designer & Fashion Bag offered by us are best in the industry. Our Designer Jewelery are available in various elegant designs and finish. We also provide Ladies Footwear that are available at affordable prices. Along with that we offer a qualitative range of Casual T-Shirts.